I recently received a?wonderful?update from Cassie B. in Montana, who adopted a delightful little blind girl from us many years ago. We had named her Nevada because she came from a shelter in that state, and here is our blog post from 2007 announcing her arrival and how she came to us. (Note there is a video in that post that no longer works.) Cassie adopted her later than year, and renamed her Bindi. Here’s an earlier update from Cassie on Bindi. “I am attaching a fairly recent photo of Bindi?I can’t believe how grown up? she is compared to the photos of when she first came to Rolling Dog. It’s hard to believe she is almost 9-years-old! In spite of the gray muzzle, she is doing GREAT, and is such a sassy-pants. She is still in charge of everybody. Our 4-legged head count is currently at four, and Bindi has become the matriarch, which suits her. She expects everyone to cater to her, including her humans. Because of our amazing vet, Bindi’s seizures are completely under control and she is in great health. She tears around the yard, climbs up & down the stairs, jumps on the couch?all with the confidence & skill of a sighted dog. We are always in awe of her ability to memorize her surroundings. What a nice story and photo. I can see her being the boss. I can’t help but wonder who that paw poking into the photo on the bottom left belongs to. One of Bindi’s friends, I guess. Thanks for the update and the great photo. What a pretty girl! I don’t think I’d read Bindi’s original story before. She sounds like she’s always been a real sweetie. What a beautiful dog….thanks to everyone who helped save her and provide such a wonderful home. Wonderful update on Bindi. 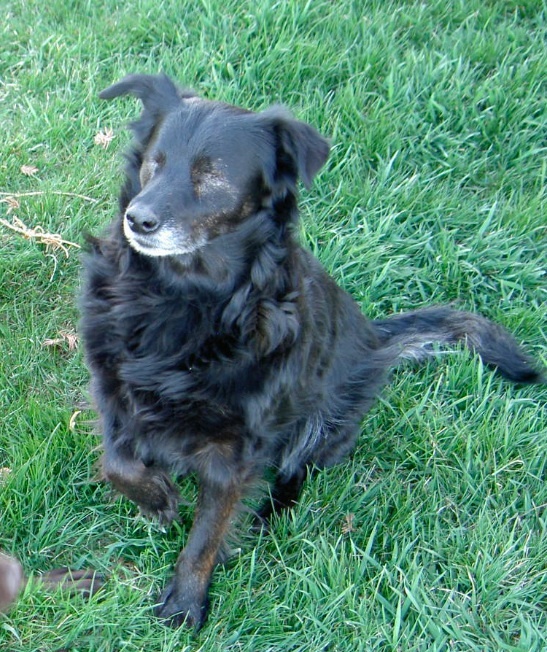 We adopted Brandy, 11 & blind, looked just like Bindi, She was only with us 1 year but believe it was her happiest! Miss her always. I remember Nevada/Bindi – gasping when I 1st saw her as she resembled my own dear Annie so closely. I was so thrilled to hear of her adoption after so much wonderful support from you all. It took “a village” of kindness for Bindi to find her forever home. Nothing is more wonderful than seeing this beauty thrive and lift everyone around her. Congratulations! Hugs! So wonderful! Thanks for this Cassie! thriving and has a very happy life. Happy 10th Birthday to Bindi andwhenever that comes around. Such a heartwarming story to start my day! Thank you RDF, Cassie and everyone involved. Saving a life saves (and uplifts) many others. I love to read these wonderful updates. I remember her. What a wonderful life. Thank you Rolling Dog & Cassie for giving her that chance.